The name Cycnoches is derived from the Greek words ‘kyknos’ meaning swan and ‘auchen’ meaning neck and is in reference to the thin arching column of the male flowers. 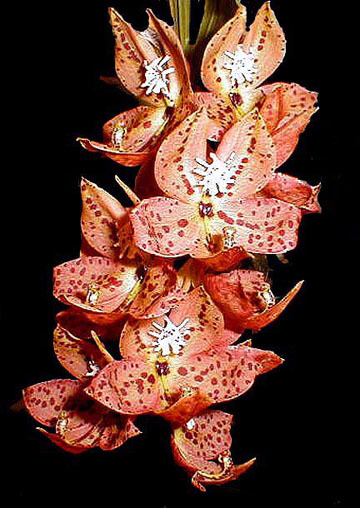 They are New World orchids found growing from sea level to around 1800 feet or so in elevation. They are found from Mexico down through Central America into the Amazon Basin of South America. They have cigar shaped fleshy pseudobulbs of several internodes topped by a few thin heavily veined large leaves. The pseudobulbs themselves can be from approximately 8 inches tall to more than 20+ inches tall. As a general rule, the taller the plant, the thicker the pseudobulb. The flowers which are produced on the apical portion of the pseudobulb can be single or up to as many as 30+ on an inflorescence. They can range from about an inch in size to over 6 inches. The inflorescence can be erect to arching to pendulous. Each pseudobulb, depending on the species, can produce one to several spikes with some producing up to 6 or more. The flowers are fairly long lived especially when compared to Catasetums and many are extremely fragrant.. 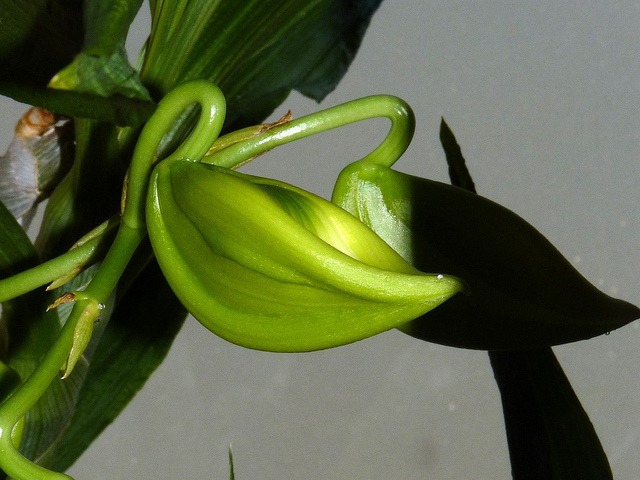 The Flowers of Cycnoches chlorochilon may last one to two weeks, depending on the temperature. Flowers produced in the winter usually last longer than those produced in the fall. Flowers of Cvcnoches chlorochilon are more like that of green Cattleya hybrids than the closely related species and hybrids of Catasetum. As the flowers age the green sepals and petals of these species yellow or bronze with age, and exposure to bright light and heat. For that reason bring flowering plants of cycnoches out of the light and away from the heat into the interior of rooms where they can be enjoyed. Despite their vigor and size, pseudobulbs of these Cycnoches species seldom last more than two or three years. They typically grow and flower their first year, produce another pseudobulb the next, and decline and die by the end of their third year in all but the healthiest specimens. Because of this trait, cycnoches rarely have more than three pseudobulbs at any one time. Pseudobulbs of cycnoches stay narrow but grow tall, fitting comfortably in moderately sized.